The suggested donation for use of this treat is $3.00. Click here to learn more. Focus: God's judgment of sinful people and His mercy towards his followers. Read the account of Noah from a condensed children's version of the Bible (Genesis 6-9). What You Need: Small pita pockets cut in half, chocolate frosting, animal crackers, plastic knives, paper plates. What You Do: Spread chocolate frosting on the inside of the pita pocket (frosting represents the pitch). 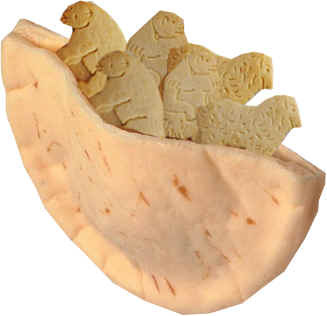 Choose a few pairs of animal crackers to place inside. Eat and enjoy. Let the sweetness of this treat remind you that when you follow and obey God, your life will be sweeter, because you are God's child and he loves you. If you like this Yummy Devotion, then check out our Hands-On Bible curriculum, "Super Heroes of the Bible."